Find resources to prepare for the HSPT, with study guides, online courses, practice tests and more. Some private high schools use the HSPT in their admission determinations. For more informations on the high school placement test, see the HSPT Guide. The HSPT is published by Scholastic Testing Services, Inc.
Flashcards to help you improve your score on the High School Placement Test. Organization: Scholastic Testing Services, Inc.
(630) 766.7150	 THe HSPT is taken by 8th graders to determine the skill set they possess when they enter high school. The HSPT is published by Scholastic Testing Services, Inc. The High School Placement Test is used by private and parochial schools as part of the admissions process. The test helps to show school administators both a student's current knowledge and future learning potential. Tests are generally multiple choice and can last for as long as three hours. 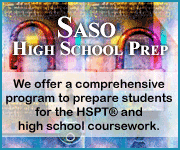 To learn more about high school placement tests, please see our HSPT Test Guide.